Northern Sami is used in the municipal administration of six municipalities, Lule Sami in one, Finnish/Kven in one, and Southern Sami in one. Includes Svalbard and Jan Mayen. An Noruega (Kongeriket Norge - Kongeriket Noreg) usa ka nasod ha Europa. An ulohan hini amo an syudad han Oslo. ↑ "Statistics Norway — Immigration and immigrants". Statistics Norway. Ginkuhà 2009-03-08. ↑ "Arealstatistics for Norway 2019". Kartverket, mapping directory for Norway. 2019. Ginkuhà 2019-03-26. ↑ "Population, 2019-01-01". Statistics Norway. 2019-02-22. Ginkuhà 2019-03-12. 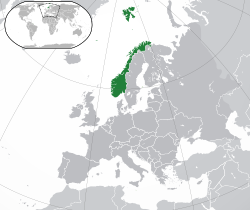 ↑ 4.0 4.1 4.2 4.3 "Norway". International Monetary Fund. Ginkuhà 2009-10-01. ↑ Hverven, Marit (2009-05-16). "«Ja, vi elsker» 150 år". Norsk rikskringkasting (ha Norwegian). NRK. Ginkuhà 2009-05-22. Ini nga pakli kataposan nga ginliwat dida han 17:14, 26 Marso 2019.